Before they compete in the 2010 Pro Bowl Jan. 31, some of the NFL’s biggest stars are coming together together as one team today to build a playground with KaBOOM! as part of the largest community program in the league’s history. Following morning practices Pro Bowl players, coaches and Bank of America community volunteers will spend the afternoon working to improve the South Florida community as part of the first-ever "NFL PLAY 60 Community Blitz" in celebration of the Pro Bowl. The playground build will take place at RISE Academy School of Science and Technology, a free public charter elementary school in Broward County. Players will be joined by NFL Commissioner Roger Goodell, NFLPA Executive Director DeMaurice Smith, as well as ESPN commentators Jon Gruden, Ron Jaworski and Mike Tirico and will work with KaBOOM!, RISE students, Bank of America associates and other community volunteers to construct a customized playground at the school, which is currently without a gym or play area. Simultaneously, other players and Bank of America associates will be working on two other service projects in Miami-Dade and Palm Beach counties. All the projects are each designed to help local children stay healthy and active as part of NFL PLAY 60, the league’s campaign to fight childhood obesity. Bank of America also will donate $100,000 to PLAY 60 non-profit community partners as part of the program. You can learn more information about the Blitz here and we'll be live-tweeting the event throughout the day. 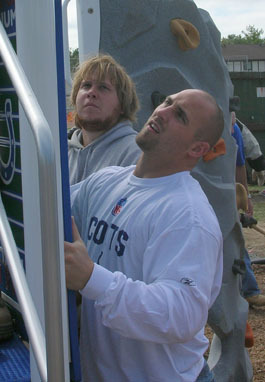 Then you can see all the great players who helped build the playground in action when the Pro Bowl is played on Jan. 31 at 7:30 p.m. ET on ESPN! UPDATE: Photos from the build are now available on the NFL website.